On the upper floors of the angular FMC Tower that casts a shadow over campus and overlooks University City, contracts are being traded on the NASDAQ Futures (NFX). A team of undergraduate students in Clinical Professor Jodi Cataline’s MGMT370 consulting course were given an inside look at how this high tech exchange operates, and quickly gained the opportunity to be much more than passive observers. At the onset of the class, a team including NASDAQ Principal Associate General Counsel Angela Dunn gave students an introduction to futures contracts, which are agreements to buy or sell a commodity at a specific price on a date in the future. The primer included the elements of a contract and an introduction to the parties that would have interest in or could financially benefit from trading in the contracts. After covering the basics, the representatives from NASDAQ became the students’ consulting clients as they charged the class with researching and presenting ideas for a new product to be traded on the exchange. Through extensive research, the students brainstormed approximately 80 ideas. With so many products available, the students’ hard work created its own obstacles. “We ran into many challenges, but the toughest one was translating our extensive research on different assets and their industries into actionable recommendations,” explained Julius Shan, a junior finance and MIS major. Ultimately, the group determined 27 ideas had some merit and narrowed that to 10 for presentation to the client during the first midterm meeting. The NASDAQ management team listened intently, gave feedback on the strengths and weaknesses of particular products and nearly unanimously chose three to be expanded upon for further research. As the term concluded, the students presented final research to the client on the most feasible products and condensed 30-second pitches for each one. The NASDAQ team was impressed with the results. “Our goal was to bring the markets to life for students, but what we found was that they brought the markets to life for us,” said NASDAQ Futures President Daniel Carrigan. Forty-four class hours, more than 750 hours outside of class, and 3,700 miles traveled: the dedication of a Drexel student. 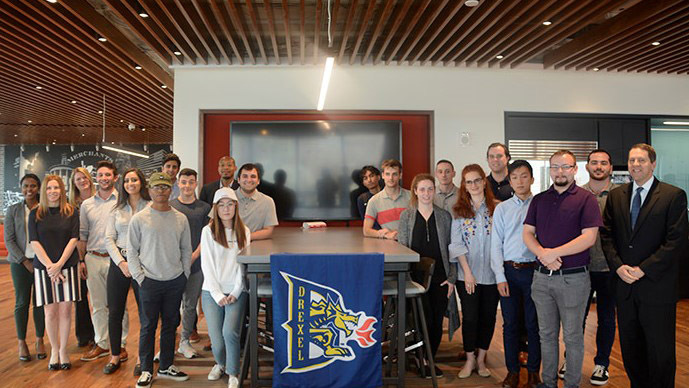 Through The Global Leadership Experience, a consulting class in partnership with Hamilton Lane, LeBow MBA students delved into the private equity industry. A group of Drexel LeBow students made some new friends both near and far during an MIS outsourcing class that connected them with students at Pennsylvania State University’s Mont Alto campus, between Chambersburg and Gettysburg, and at Ahmedabad University in Gujarat, India.